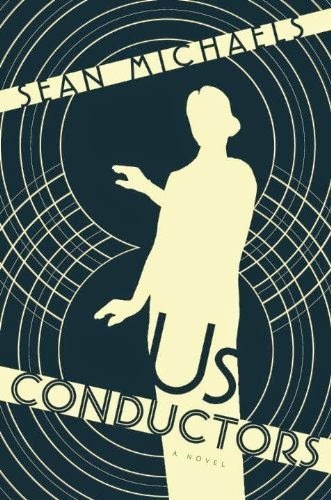 Even judged on aesthetic criteria, there are problems with the novel – especially in the first half that focuses on Theremin’s eleven-year stay in America from 1927 to 1938. After giving a performance to an impressed Lenin – Michaels has the annoying habit of allowing Theremin to revere Lenin’s name “may his memory be illuminated” in a manner similar to how Muslims venerate the Prophet whenever he is mentioned – Theremin is sent on a propaganda tour to European capitals before being sent to America to impress scientists and the public with Soviet achievements, to secure corporate contracts and to conduct a little espionage for Mother Russia by stealing corporate secrets. The structure for the novel is promising: in the first person, while he is on a cargo ship sailing back to Russia, Theremin recounts his student days in Russia and then his trip to America where he introduced the theremin to a new audience and market it and other inventions to American investors. This takes place against a backdrop of the dazzling Manhattan nightlife, concerts in front of 10,000 people at Coney Island, speakeasies, the stock market collapse and the ensuing Great Depression. In New York City, he met fellow Soviet émigré Clara Reisenberg, a violinist, and under his tutelage she becomes a theremin virtuoso. We know only from the historical record that he proposed to her, that she rejected him and married Robert Rockmore. In Michaels’ telling, Theremin becomes obsessed with her and his narrative is a love letter to her. There is no problem with this imaginative recreation of almost a lifetime of unrequited love. Martin’s documentary, which has some lovely archival footage of them and a reunion of sorts in New York when they were elderly shortly before their deaths, may have provided the inspiration for Michaels’ fictional conceit. The difficulty is that there are unexplainable gaps in describing his first marriage to Katia Pavlovna Konstantinova, the sister of his best friend in Russia. Did she accompany him to America or follow him? Where and when did the marriage breakup? One of the rare moving moments in this section is a brief meeting between Theremin and Katia in New Jersey where she is struggling to make a life of her own far from the bright lights of New York where Theremin was for a time the toast of the town. We are also provided few glimpses into to his second marriage to the African-American dancer, Lavinia Williams. He seems to have taken her for granted. There is no suggestion in the novel that one of the reasons he abandoned her is the disapproval about a racially-mixed marriage that he encountered from friends. Equally problematic is Michaels’ treatment of the New York cultural scene. Names flit through the pages: Benny Goodman, Charles Ives, Glen Miller, Albert Einstein, Charlie Chaplin, and George Gershwin among many others. But they seem to serve no other purpose than to burnish Theremin’s star power. For the most part, they cannot even be credited for providing cameo appearances since we are offered no insight into them nor do the array of celebrities tell us anything more about Theremin or their relationship with him. 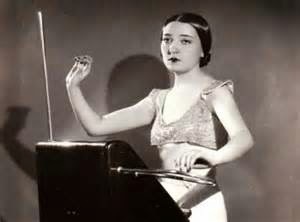 Clara Rockmore playing the theremin. Most unsettling is the egregious intentional distortions. Was it necessary to have Theremin kill a man or be a practitioner of kung-fu? Did Michaels need to recycle the myth that Theremin was abducted by his Soviet handlers? Michaels knows this story is not true because he has read the Glinsky biography. The novelist even makes passing reference to one of the real reasons he left New York on his own volition: he was in debt and owed a lot of taxes to the government. Perhaps if Michaels had dispensed with the highjacking ruse, and let us know that Theremin’s true motives were escaping an inconvenient marriage and evading money difficulties, the narrative would have been less dramatic and he would have turned Theremin into an unsympathetic protagonist. Yet despite his early work in creating a prototype for television and inventing metal detectors at Alcatraz, Theremin is presented as a deadpan manipulator who consistently lies, a prerequisite for a spy who was passing data on U.S. industrial technology to the Soviet intelligence services. The irony is that when he returns to the Soviet Union, Theremin is arrested at the height of the Terror on charges of spying for the Americans. Anyone who spent time in the West was a leading candidate for what Nikita Khrushchev later labelled “the meat grinder,” that consisted of brutal around-the-clock interrogation until a confession was signed and the terrible ordeal, if one was not executed, of the transportation to Magadan, the coldest place on earth. Once there, survival from the gruelling outdoor work or labouring in the gold mines was slim. Here Michaels is very good at providing the context for Theremin’s eight-year sentence to the Gulag, and at the same time allowing the continuation of the love letter to Clara. His stay was cut short in the frigid north when the Soviet authorities realized that he was more useful to them in developing electronic bugs and military technology. He was transferred to a relatively comfortable camp for scientists outside Moscow that Alexander Solzhenitsyn later made famous in The First Circle. Michaels incorporates into the novel Theremin’s contribution to espionage technology, the bugging device known as “The Thing,” hidden in a wooden replica of the Great Seal of the United States that hung conveniently inside the American Embassy. But for Theremin this and other achievements pale when placed against his yearning for his enduring love interest, Clara Rockmore. What I found most compelling in the concluding pages is a chilling cameo appearance by the head of the security services, the monstrous Lavrentiy Beria, who coerces Theremin into working for him. These scenes may or may not have happened but they are historically plausible. Had Michaels provided a similar cameo appearance in the first half and deleted the historical inventions, his novel would have been appreciably better.